I always had an inclination towards anthropomorphism. I picked up drawing to keep my most cherished childhood fantasies alive. They were inhabited by the animals I found in books, comics and farmyards I used to explore as a child. Animals both real and imaginary, both regular or anthropomorphic, intermixed and blended freely populating an inner world where there are no clearly defined bounds between human and animal. I am not content with preserving imaginary friends though - I feel the urge to let them grow up with me. They become more complex and physical as I grow. My paintings are both personal allegories and portraits of living beings, creatures with their own bodies, thoughts, feelings, sexuality; yet they will never forfeit the role of ideal models, the happy eyes, the thick fur, the nature of daydreams. I cannot imagine what life would be without this inner fauna. My aesthetic research draws from the European painting tradition and from my all-around interest for biology, ethology and veterinary medicine. However I reject any outdated symbolism based on fear of nature. Humans of the current age are irreversibly aware of their limits as a species and their belonging to a shared natural environment, therefore culture-induced fear of the non-human has no place in contemporary imagination. I search among animal shapes for the renewal of human imagination. Alessio Scalerandi is an artist from Italy. 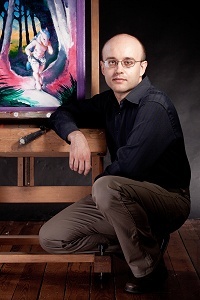 Born in 1980 in the country near Turin, he obtained a Master's Degree in Computer Science but eventually his passion for art and natural science led him to pursue a career in painting and illustration. He taught himself to draw and paint by studying the works of various favourite artists and by participating in online art communities, with further guidance from artists Laura Frus e Cinzia Ghigliano. He is currently focusing on oil painting and his work is found in private collections around the world.